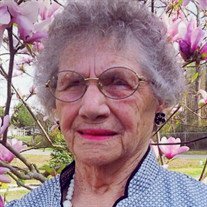 Mrs. Lueveta Macille Turner Day, age 93, of Selma, NC and formerly of Arthur, WV passed away on Wednesday, August 29, 2018 at UNCS Hospice House in Smithfield, NC. She was born December 31, 1924 in Petersburg, WV and was the daughter of the late Benjamin Ollie Turner and Ruth Ann (Rohrbaugh) Turner. In addition to her parents, she was preceded in death by her husband of 58 years John Blair Day, Jr. in 2002; her son Jeffrey Scott Day on August 4, 2018; her sister Annie Zelda Turner; two brothers Justin Turner and Eugene Turner. Surviving are one son John Blair Day III of Lexington, KY; four daughters Barbara Efaw and husband Gary of Hundred, WV, Carolyn Clauze and husband Reggie of Petersburg, WV; Rebecca Swartz and husband Roy of Selma, NC, and Betsy Day of Selma, NC. ; 10 grandchildren, 8 step-grandchildren, 5 great grandchildren; special niece Shirley Shanholtz of Hagerstown, MD, special "son" David Grizzell of Kinston, Ohio; and special neighbors Lee and Trudy Bizzell of Selma, NC. Funeral services will be Sunday, September 2 at 2:00 at Schaeffer Funeral Home with Pastor Rick Bergdoll officiating. Family will receive friends one hour prior to the funeral service at 2:00 p.m.
Burial will be in Mt. Carmel Cemetery at Arthur, WV. The family suggests that memorials may be made to St. Jude's Children's Research Hospital (designate leukemia research).